Christians typically don’t read as much fiction as non-Christians do. This could be because much of secular fiction has content offensive to the Christian conscience, or because there is a dearth of quality Christian fiction to read. But I’d like to suggest a third possible reason. I think Christians would like to read more fiction, but who has the time? After work, family, church, extracurriculars with the kids, upkeep at home, Christian service, continuing education, and everything else we cram onto our calendars, there is precious little time left for reading. Even among people who want to read, non-fiction becomes the default priority in an effort to make the most of our time, as Ephesians 5:16 says. Ironically, the problem is actually compounded by the publishing industry itself! Traditional publishing practices don’t help matters when fiction offerings are as prohibitively long as they often tend to be. In the traditional model, in order to make money the economics work a typical novel has to clock in at 70,000+ words. I won’t take the time here to go into the technicalities, but anything short of that and the price points don’t work out well. 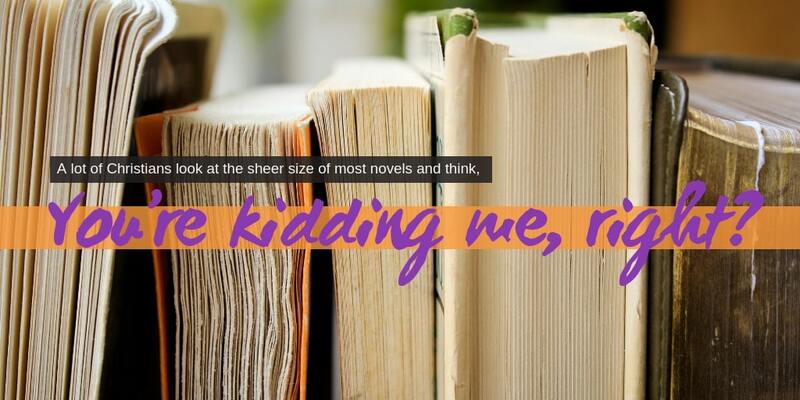 I think a lot of Christians look at the sheer size of most novels and think, You’re kidding me, right? So, in keeping with an almost nine-year history of publishing mostly short books, Cruciform Press, in its new Cruciform Fiction line, is publishing novels that are short and readable, typically about one hundred pages. These novellas, as that length is usually called, allow you to dive into an easy-to-read book, get a fiction-fix from a good, entertaining story, and then climb out and get on with the rest of your life—and if we met our goal, along the way you will have received some encouragement, envisioning, or clarity for your faith, or at least food for thought as a believer. You’re not committing to 300+ pages of reading. You’re not buying a two-inch thick book only to feel like you wasted your money as you watch your bookmark lay stagnant at the ¾-inch mark. You pay a few dollars (rather than $20+ for a new full-length hardcover release!) for a hundred or so pages, you watch a movie in your head while you read, and then you get back to reality before too much of your life passes by. There are plenty of good reasons to give novellas a try, but maybe the best one is simply because novellas are fiction you’ll actually have time to read! Ernie Bowman is the Associate Pastor of Calvary Baptist Church in Ypsilanti, Michigan. Also a part-time Bible teacher and writer, he blogs regularly at www.thefoolish1.com about living for Jesus, church life, books, and education.